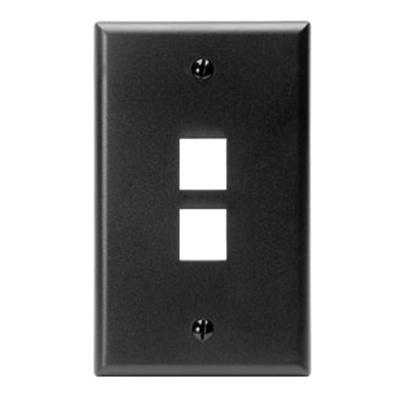 Leviton QuickPort® 1-Gang 2-Port Wallplate in black color, has durable ABS plastic construction. It measures 2.77-Inch x 0.45-Inch x 4.53-Inch. This rectangular wallplate mounts in vertical orientation using screws. It is suitable for use with QuickPort® connectors and adapters. Wallplate comes with color matched mounting screws. The narrow module width of this wallplate allows high port density in small area. Wallplate is UL listed, CSA certified and meets ANSI/TIA standards.